July is Watercolor Month at Creativebug! 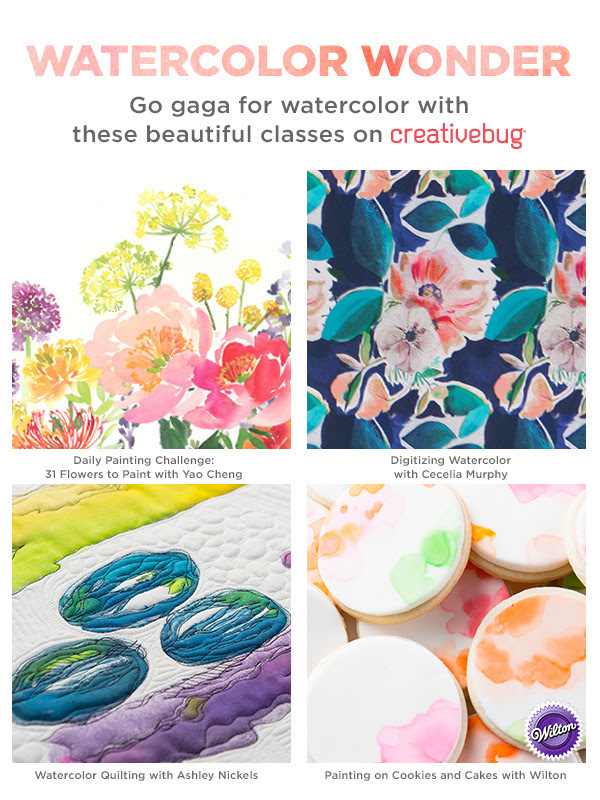 July is the best month to highlight Creativebug's gorgeous watercolor classes. You'll learn everything from the basics of watercolor to how to digitize their artwork, and even how to take your skills up a notch and incorporate watercolor into non-traditional projects. One of the classes that is already up is by Yao Cheng. Join her Daily Watercolor Challenge: 31 Flowers to Paint and learn how to paint 31 different flowers in her free-flowing and carefree style. Once a masterpiece is created learn how to Digitize Watercolor by scanning a painting onto a computer. Cecelia Murphy teaches how to use computer programs to change color and even design your own fabric! Think outside the box with Watercolor Quilting taught by Ashley Nickels. In this class Ashley teaches how to design on fabric with watercolor, and then turn that design into a quilt top complete with unique stitching. Coming July 12th! Take watercolor off the paper and onto sweet treats by learning how to Paint on Cookies and Cakes. Taught by Wilton Instructors this 3-part class will show you unique tips and techniques for turning cookies and cakes into your own work of art. Find your watercolor inspiration and sign up at Creativebug and join them on their Watercolor Month!